Shelby Benton, former president of the North Carolina Bar Association, testifies at a House Select Committee on Redistricting meeting on Tuesday. (CJ photo by Dan Way). If the separation-of-powers undertones in the judicial redistricting process weren’t already obvious, state Rep. Justin Burr, R-Stanly, left no doubt Tuesday. The General Assembly is exercising its authority to redraw district and Superior Court maps “not for the benefit of lawyers, but for the benefit of the people of this state,” Burr said after presiding over a meeting of the House Select Committee on Redistricting he chairs. Several lawyers and judges agreed during the 2 ½-hour meeting it’s a good idea to update and reconfigure the judicial districts. The most recent time that was done Dwight Eisenhower was president, “The $64,000 Question” was the top-rated TV show, and Mitch Miller and The Drifters were among the biggest pop music acts. All of the judicial branch witnesses — and some Democrat members of the committee — implored Burr to slow the process, engage all of the stakeholders, and conduct a meticulous review, even if that means pushing a vote on a reform bill into the next legislative session. “This is serious business. This is even more important than drawing our [legislative] district lines,” said Rep. Rodney Moore, D-Mecklenburg. Burr was unswayed. He cited a pressing need to modernize and clean up judicial districts. Many have serious disparities, which were created by incremental changes in the 60 years since they were last drawn. As an example, he said Mecklenburg County has three Superior Court districts with a total of seven judges. One district has 450,000 residents and another 150,000, but each elects two judges. “I believe those voters are being disenfranchised, and that’s not right,” Burr said. The proposed redistricting draws two Superior Court districts in the county, with 466,000 and 453,000 residents. There are structural differences in how urban and rural counties elect judges, and the system should be uniform to drive out inefficiencies and better use taxpayer money, he said. Noting the judicial branch officials testified the system needs updating, he chided them for recognizing the problems have existed for years but not advancing proposals to solve them. The legislative branch has an obligation to do that, he said. Rep. John Blust, R-Guilford, said the legislature may need to expand the scope of reform beyond remapping. He said he regularly receives complaints from constituents that District Court judges are unfair, the system is rigged, and some lawyers get preferred treatment due to connections with judges. He wondered whether those judges should be rotated in a circuit similar to Superior Court judges. 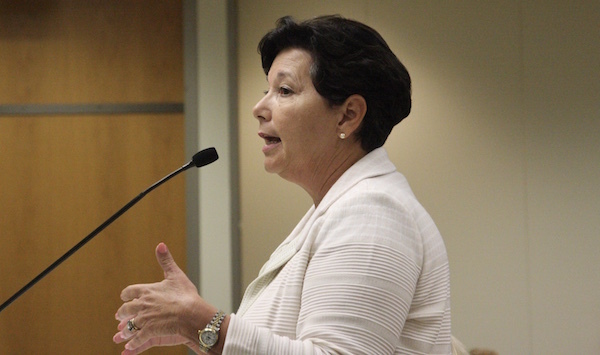 Athena Brooks, chief district court judge of Henderson, Polk and Transylvania counties, testified the judicial redistricting in House Bill 717 would force short-term change that will disrupt the bench and impact a fair and impartial administration of justice. Sitting judges with the most experience would be forced to run against one another, or be drawn out of their districts “without any regard to their fitness or job performance,” Brooks said. Lawmakers should delay any decisions until they meet with stakeholders in a deliberate, transparent process, she said. Joseph Crosswhite is senior resident Superior Court judge for Alexander and Iredell counties, and president of the North Carolina Conference of Superior Court Judges. He urged a go-slow approach while tapping into the wisdom and experience of judicial officials in the field. He said each judicial district has its own anomalies, unique character, and concerns. A rush to uniformity without taking regional differences into account could have an ill effect on the court system. Caryn McNeill, president of the N.C. Bar Association, and Shelby Benton, former president, said they didn’t object to redistricting to ensure fairness and balance. But they cautioned that information they gathered from a survey of judges shows reasons to conduct a deliberative process. More travel time due to expanded districts would lead to more overnight stays and higher costs to the state. Spending nights away from home would discourage young people with families and especially women from seeking judgeships. Increased travel time would decrease the availability of judges to sign after-hours arrest and search warrants. It also could increase costs to law agencies if they have to travel to where the judge is staying. In turn, that would delay the ability to respond to criminal matters. Benton said redistricting could impair relationships District Court officials have built with a wide array of agencies that come into regular contact with courts. Under the proposed maps, the District Court in which she practices law might lose six days of trial court per month due to taking on another county.